State bodies and organizations that purchase software necessary for their work will have to choose from programs included in a special register of Russian software. Russian politicians and officials have repeatedly warned against the use foreign-made software in state bodies and government-owned companies due to the threats of surveillance and data leaks. Russian Prime Minister Dmitry Medvedev has approved a plan under which local software companies receive strong preferences in tenders announced by federal ministries and other bodies of state power. “I have approved the plan of transition to the Russian-made software for federal bodies of executive power as well as state-owned non-budget funds. The plan takes three years, including the current year,” the PM said at the session of the government commission for information technology. Over this period of time, the government must prepare all necessary legal acts and requirements for the various software needed for operations of state bodies, including the standards for cloud technology. The federal law and government order banning the use of all foreign-produced software in state and municipal agencies came into force in Russia on January 1 this year. According to these documents, state bodies and organizations that purchase software necessary for their work will have to choose from programs included in a special register of Russian software. The register includes software copyrighted by the Russian government, state agencies, municipal bodies and Russia-registered non-profit groups or commercial companies - of which at least 50 percent is owned by Russians. The software must be available all over the country and the share of license fees paid to foreign legal entities must not exceed 30 percent of overall proceeds. Currently there are about 1,000 software products in the register, but industry experts earlier told reporters that this number could rise to several thousand before the end of the year. Exceptions are allowed in cases when the register lacks any programs with the necessary technical or operating features, but agencies intending to purchase foreign-made software would have to back their bid with a review from a group of independent experts. The law setting preferences for Russian software producers is a part of a larger import-replacing plan that was presented to Medvedev by the Communications Ministry in early 2015. Apart from the foreign-made software ban, the document provides for government support to Russian software firms and measures to promote the development of the nation’s own operating systems. In October 2015, a group of leftist and nationalist MPs promised to draft a bill that would ban any use of products by Google, Yahoo and WhatsApp for government workers, under threat of fines or even dismissal. 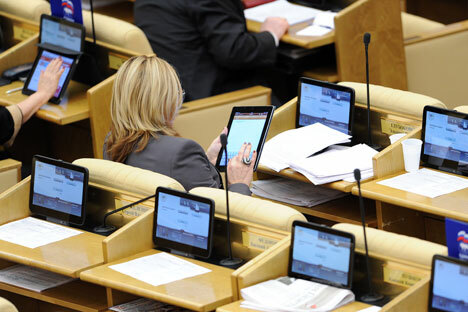 In 2014, members of the center-left party Fair Russia proposed officially recommending that all parliamentarians to stop using iPhones and iPads – also over fears of eavesdropping by foreign special services. In mid-2013, MPs from the parliamentary majority United Russia party asked the Defense Ministry, Federal Security Service and the Communications Ministry immediately to limit civil servants’ access to the US internet services and social networks such as Gmail and Facebook. They also suggested that violators of the ban should be tried for high treason, which in Russia carries punishment of up to 20 years behind bars. This proposal has not inspired any legislative movements so far.